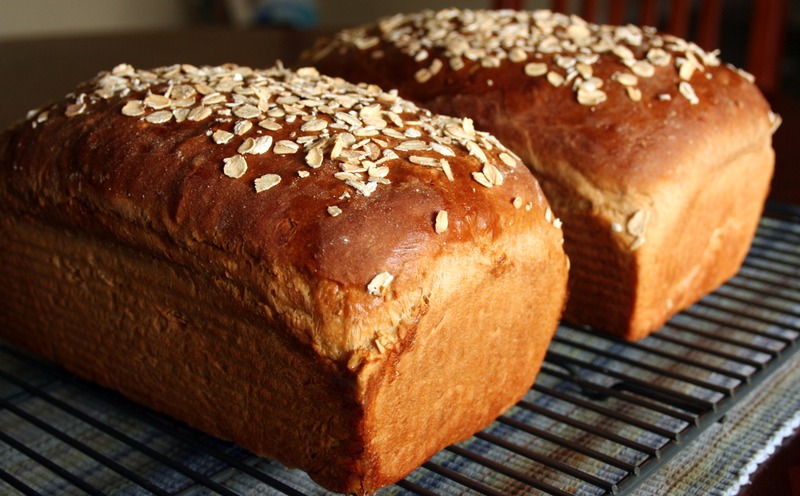 Mmm…these smell wonderful while baking – but don’t all breads? That smell will never get old to me – it’s always so comforting. Anyway, this is another brand new recipe for us to try; and I spent a lot of time finding it so hopefully it tastes as good as it looks. This makes two 8×4 inch loaves, so once they’re completely cool I’ll wrap and freeze one. I have found that freezing and thawing bread doesn’t affect the taste or texture at all – I love that. Verdict: This loaf is so good. Not too wheaty and not at all bitter from the wheat flour. It has a nice texture and chew and it’s my favorite mostly whole wheat loaf I have made so far. 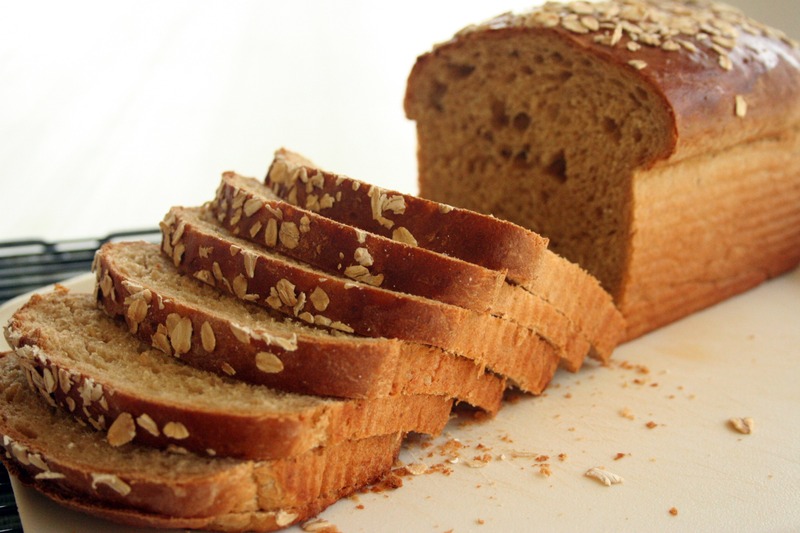 I love the dark crust of this bread and the texture of the toasted oats on top. I hope my family enjoys it as much as I do because I’m always looking for more ways to give them foods with more nutrition and fiber. Thanks for reading, enjoy! Heat milk in a 4-cup measuring cup and stir in oats. Let stand, uncovered, stirring occasionally. Add water, melted butter and honey – stir to combine. Set aside to cool to about 105 degrees before adding to the flour mixture. Stir together whole-wheat flour, unbleached flour, yeast, salt in a standing mixer bowl. Add oat mixture, stirring with a dough whisk or wooden spoon until a soft dough forms. Using your dough hook, knead adding more flour a tablespoon at a time (if needed – I used 5 more TBSP) to keep from sticking, until dough is smooth, soft, and elastic – about 5 to 7 minutes (dough will be slightly sticky). Form dough into a ball and transfer to an oiled large bowl, turning to coat. Cover bowl loosely with plastic wrap; let rise at warm room temperature until doubled in bulk, 1 to 1 1/2 hours. Lightly grease loaf pans. Turn out dough onto a lightly floured surface and knead several times to remove air. Divide dough in half and shape each half into a loaf, then place 1 loaf in each pan, seam side down, tucking ends gently to fit. Cover loaf pans loosely with a kitchen towel or plastic wrap and let dough rise in a draft-free place at warm room temperature until doubled in bulk, about 1 hour.